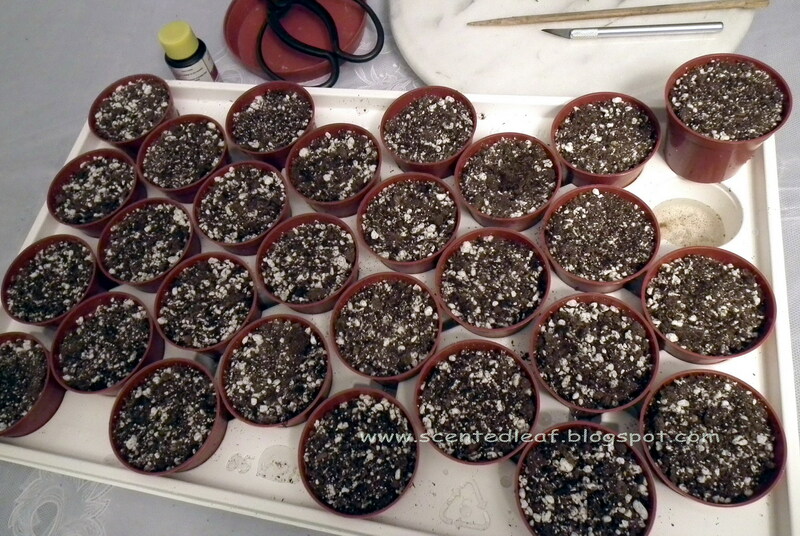 September seems the best times to root pelargoniums cuttings, based on our experience. Well, there is no harm in trying year round to clone your plants and actually we are doing this trying various methods to root them... just we have had the best result with those taken in the fall. 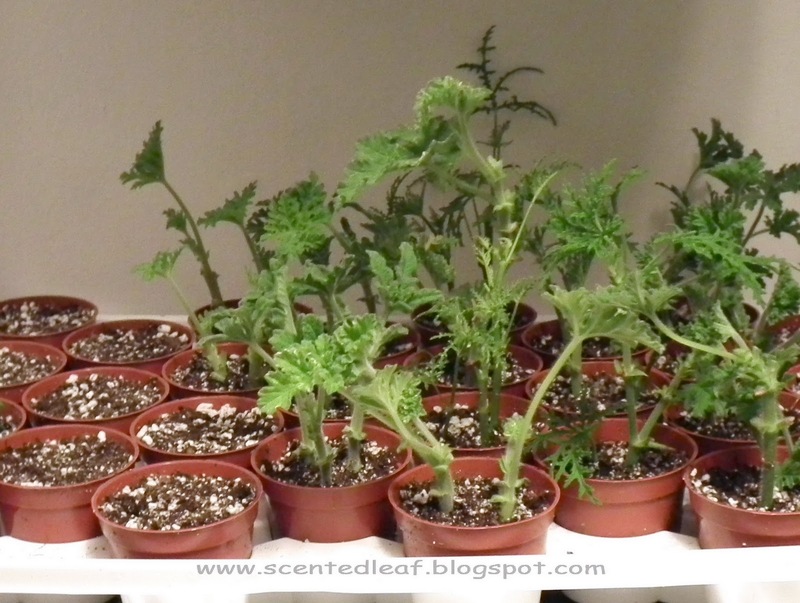 Pelargoniums and geraniums are extremely easy to take cuttings from, and the successful new ones cloned have same properties like the mother plants. So, with the hope that I will increase again my stock of scented plants, I took cuttings and bring them indoors. The best secret to root in a few weeks pelargonium and geranium cuttings seems to be to keep the cuttings in a warm spot (in greenhouse or close to the window), avoiding direct sunlight, and maintaining the soil moist but NOT WET. We started our new batch of fall cuttings using a heat mat, because is good to provide bottom heated propagator for quick rooting. We trimmed the cuttings from the top of the vigourous branches, just below a leaf joint (or growth node, meristem) and removed the flower heads and lower leaves from the stems. 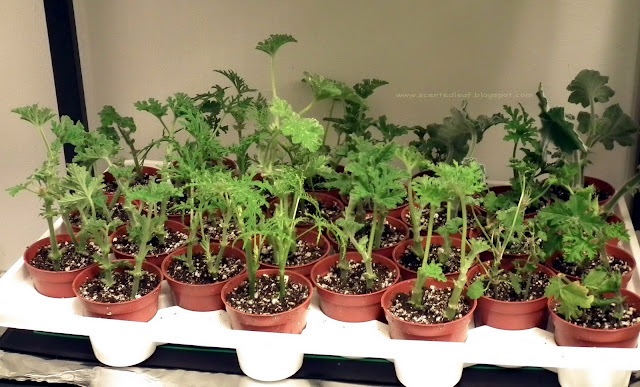 We bought this time one seeds tray made from a high-density plastic (quite sturdy), with a self-watering system for 28 cells (3"pots). We filled the pots with potting on mix (1/2 peat moss, 1/2 perlite) and in most of them we popped 2 cuttings after we dipped them in a rooting gel. The cuttings tray is going in a spot with light but not in direct sunlight, on top of a heat mat. 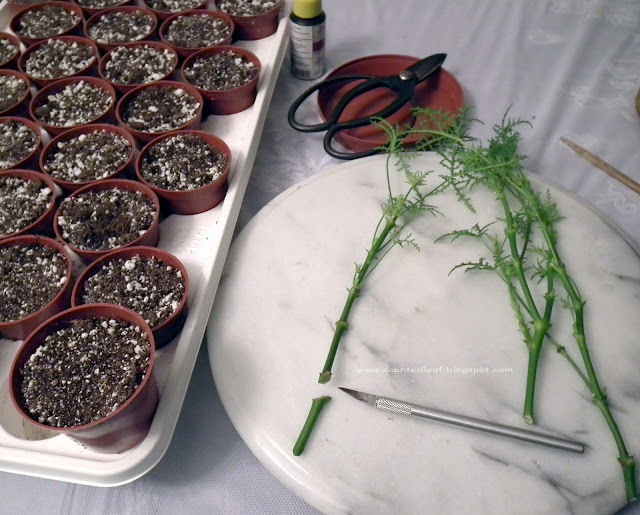 To watering them, we use boiled water already cooled down to room temperature and will keep the soil moist and warm for few weeks(but not soaking as the cuttings may rot). Well, I cross my fingers for my new plants. I’ll keep you updated on their progress.